Centric Design Studio’s approach to design helps to fuel Detroit’s economy and increase diversity and equity in the field of architecture. On March 29th, at 6:30 pm, Detroit Home Magazine announced the winners of the 14th Annual Design Award show at the [Max M. and Marjorie S. Fisher Music Center, Detroit, MI.] This year Saundra Little and Damon Thomas of Centric Design Studio (CDS) were honored as first place winners for their work on the David Klein Art Gallery in the category of Retail Interior Design (Boutiques, Stores, Salons). Over the past few years Centric Design Studio has experienced phenomenal growth, performing unique designs in Detroit’s midtown and downtown areas on spaces such as TechTown, SpaceLab Detroit, and St. Andrews Hall. Little and Thomas understand how architecture and design help to shape the physical identity of Detroit and fuel Detroit’s growth and ability to attract and retain talent. As a minority owned firm, CDS is also working to increase diversity and equity within Detroit’s economy and in the field of architecture. Their firm has created a pipeline through which a diverse group of young students gain hands on experience in architecture and design. Through their passion for sustainability and their eye for design the partners have a way of adapting Detroit’s renown post industrial building stock into co-working spaces, and a world class entertainment spot that will continue to attract a diverse group of entrepreneurs, architects, designers and artists to the Metro Detroit region. The design of the David Klein Art Gallery was intended to be a place where the owner who is a member of the Art Dealers Association of America (ADAA), could realize his vision of bringing a national presence to Detroit’s diverse art culture. The first David Klein Art Gallery originated on Townsend Street in Birmingham, MI and their second location on Washington Blvd. in Detroit, serves as a flagship location. The partners state their biggest design challenge was completely opening a space which had been departmentalized into several storage rooms, offices and a balcony into the now free flowing premiere ground level space with 15 feet high ceilings, Doric columns combined with fresh new updates. 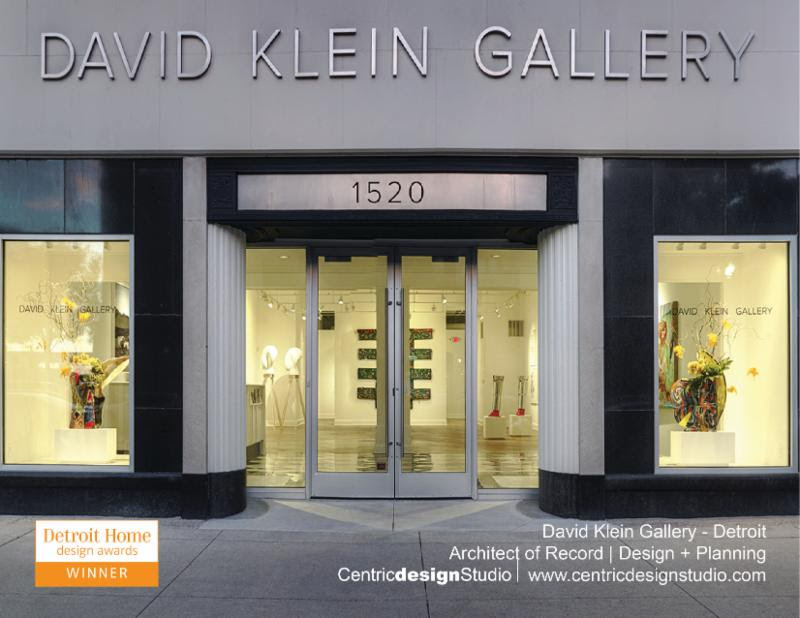 As technology and the way we do business continues to influence the ways in which we live and work, good design preserves and adapts historical gems such as the David Klein Gallery, and helps Detroit maintain its world renown architecture and design legacy.